FAITHFULLY LIVE - Journey Tribute Sensation! People are talking about FAITHFULLY LIVE, featuring Jeff Salado! Journey dominated arenas worldwide in the late 70s, 80s, and the amazing comeback in the mid-90s. What if you could see a band like that again? Journey still tours, but for those longing for the "voice" of the band that was fronted by Steve Perry back in the day should now treat yourself to FAITHFULLY LIVE - "Reliving the Glory Days of Journey" - a concert re-creation of the band covering its greatest smash hits from 1978-1996. 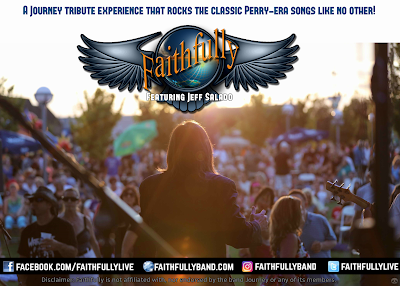 With the distinctive lead vocals of JEFF SALADO, who delivers the signature Perry tone, FAITHFULLY LIVE features fantastic harmonies and dynamic instrumentals. FAITHFULLY LIVE recreates note-for-note accurate renditions of Journey classics all in their original keys, and gives its audience an uncannily accurate tribute to the "Perry & Rolie" sound without pre-recorded backing tracks or digital vocal enhancements. Along with his band mates, Jeff takes FAITHFULLY LIVE audiences on a rhythmic ride to an era when rock dominated the radio airwaves. The veteran, professional and gifted musicians of FAITHFULLY LIVE deliver that organic live sound of Journey during the album oriented rock era, and audiences always leave a concert ready to rock with the band again. Jeff founded the band Off-Kilter in 2005, and soon after changed the name to "Arrival, a Tribute to Journey." In 2010, the band became known as Journey Revisited, and in January 2017, with a fresh lineup the band kicked off the year as FAITHFULLY LIVE. FAITHFULLY LIVE has opened for Foghat, Warrant, Queensrÿche, Firehouse, and Pat Travers; the band performs regularly at casinos, festivals, fairs, and corporate functions in Northern and Southern California and the East Coast. FAITHFULLY LIVE delivers that organic live sound of Journey during the album-oriented rock era, just the way you remembered it!